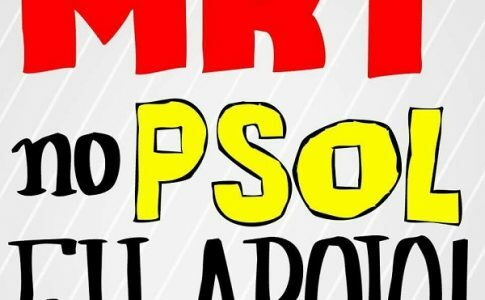 Hundreds of thousands of people marched in Santiago and a number of regions throughout the country in opposition to the Government proposed education reforms. The professors took the lead, firmly stating that the current Carrera Profesional Docente (a regulation governing the career path of education workers in the form of evaluations and incentives) does not represent them and that the mobilizations will continue while the students march arm and arm for free education and against political repression. Will the Government continue to ignore the demands of those taking to the streets? 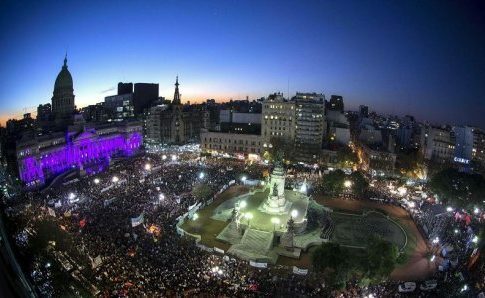 Even though the Government and the mainstream media are portraying the students as being violent vandals, and despite the fact that they forced the rerouting of the march so that it wouldn’t pass through the Alameda (a main avenue in Santiago), around 200 thousand people took to the streets in Santiago, making it one of the biggest marches this year. 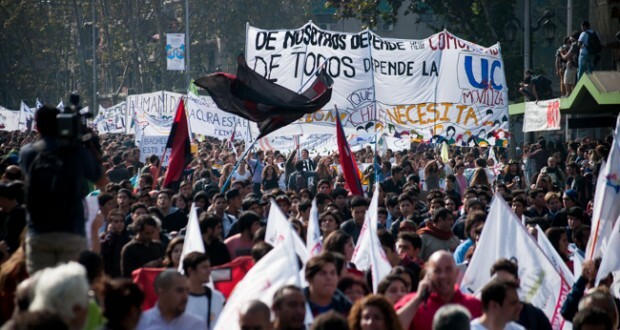 This is the fifth mass march lead by students and professors in the past few months: On April 16, May 14 and 28, 150,000 people took to the streets in Santiago alone. On June 3, 70,000 people marched, and in the latest march, 200,000 people took to the streets. There is a clear establishment of unity between students and professors. While the Government and the leaders of the union Teacher’s College (Colegio de Profesores) try to reach an agreement about the Carrera Profesional Docente, thousands of professors took to the streets once again in protest against the current Government proposal. They know that the only way that their demands will be met is through the means of nationwide mobilizations. The presence of the professors at the march was impressive. In Santiago, public and private school teachers participated in the march. The teachers also marched along with members of their respective organizations and communities, demonstrating the strong ties built within the workplace and with the broader community. 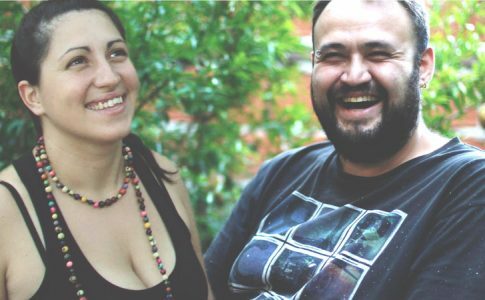 A diverse number of community members were also present such as La Pintana, La Florida, Maipú, Macul, Til Til, Peñaflor, Pirque, Calera de Tango, Qulicura, Puente Alto, Colina, Buin, Santiago, Curacaví, amongst others. The professors marched with vigor and conviction, voicing their frustration with the leaders of the country who are refusing to hear the professors’ demands. They carried signs and banners and sang songs protesting the Carrera Profesional Docente, the oppressive working conditions, and the exploitation that they face daily. Mauricio Páez, President of the Maipú Teachers Committee (working with 27 municipal schools) also spoke with La Izquierda Diario Chile about the Government’s proposal: “It’s a proposal based on the market and doesn’t address what is really happening in the schools.” He also said that over 50 thousand professors reject the proposal, and he thinks it’s ridiculous that the government insists on passing it without the support of the professors. The professors also marched in cities like Temuco, where around 6 thousand teachers took to the streets as well in other parts of the country such as Iquique, Valparaíso, Puerto Montt, Antofagasta, Arica. Students from the Usach, Universidad de Chile, Universidad Central, Finis Terrae, Universidad Diego Portales, Universidad Católica, Universidad Alberto Hurtado, Universidad Tecnológica Metropolitana, and ex Pedagógico participated in the march in Santiago. The ACES and CONES organizations, which represent high school students, were also present at the march. There was also a strong presences of political organizations like La Agrupación Combativa y Revolucionaria, Juventud Guevarista, NAU, Izquierda Autónoma, Juventud Rebelde, Juventudes Comunistas, Revolución Democrática, amongst others. The creativity of the youth energized the march from the beginning to the end. The theater students from la Universidad Finis Terrae dressed up as bosses, CEO’s, politicians, and members of the upper class to express the hypocrisy of those sectors that make money off of education while they talk about how they want better conditions for the general population. As part of the protests, there were a series of student occupations, demonstrating how it’s taking on a more radicalized method of struggle. Right now students are occupying a number of schools and universities such as Universidad Alberto Hurtado, la Facultad de Derecho, Ciencias sociales y Comunicación de la Universidad Diego Portales, el Liceo Cervantes, Darío Salas, la Facultad de Derecho de la Universidad de Chile.